- Some people are reporting that the mod is still working and some aren't. In my personal testing, with a Generation 7 legacy save that ran for two in-game days, no culling occurred. - People who are reporting culling seem to be reporting the deletion of single townies one at a time, rather than huge family-tree destroying purges. This leads me to believe some new function in the game is behind this that is outside of the current scope of this mod. - I run my game with Deaderpool's MC Command Center mod, which includes its own townie generation and code for culling ghosts. It is entirely possible that I haven't experienced any culling because whatever new functions EA might have added have been overridden by Deaderpool's code. I'd advise anyone experiencing family tree destruction to install this mode and its Cleaner module, which has a "Bypass Family Ghosts" function. For the most part, I'm 99% sure this mod is still working as intended and is still safe for use. Be sure, of course, to backup your game saves in case I'm wrong and culling does occur. It is unlikely I'll be able to update this mod any time soon because I'm just swamped at the moment with my day job and I'm also going back to uni in a few weeks. Even if I did have the time, I'm not an expert with Python by any means, and I don't know where EA has added any new code or what exactly needs updating. It was hard enough for me to figure out how to remove the functions I already have in a very rough manner -- any major scripting or rewriting is something that I just can't do. I'm sorry for this. Unlike The Sims 3, TS4 is pretty good at keeping the town populated, in my opinion. There are more than enough new townies in each generation for my Sims to find friends, enemies and partners and to prevent the town from stagnating. There's a slight problem, though. Vanilla TS4 includes a population limit of 180 Sims. Since this includes dead Sims as well as living Sims, anyone playing for a long enough time will usually reach the limit, at which point the game will begin deleting any new Sims that enter the town, making the game pretty much unplayable. 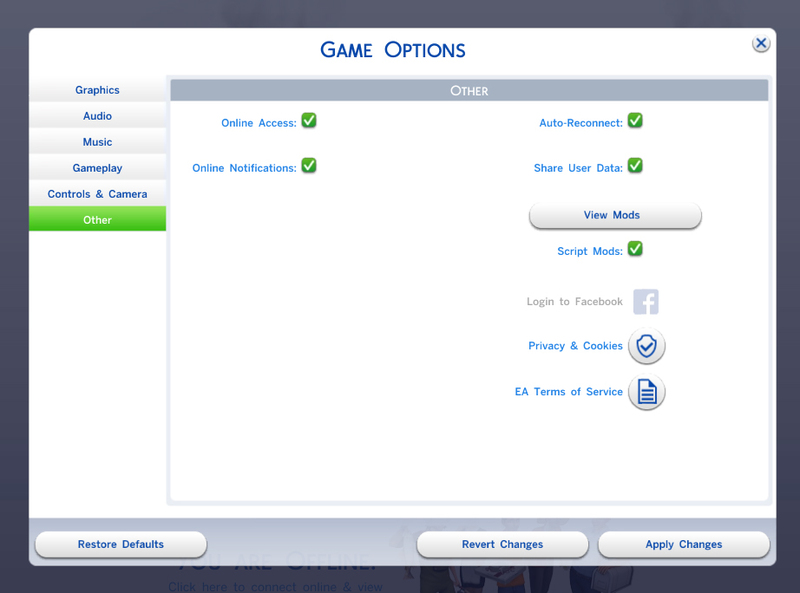 This mod will disable this functionality, preventing any Sims from disappearing. This mod will also stop the mass culling that happens upon loading a game since the March 26 patch. This mod replaces the culling action in the game's Python files via scripting. The replacement action has no function, so when the game attempts to run the culling action, nothing will happen. This mod was based on game version 1.5.139.1020 (March 26 patch) but it should work just fine on previous patch levels as the culling function is exactly the same. This mod edits the StoryProgression.Actions Python file. It is incompatible with any other mods that do so (though, as far as I know, no such mods exist yet). Some users have reported that loading screen times seem to increase if you have an exorbitant amount of Sims in your world. Use this mod at your own risk. Place the .zip file in your Electronic Arts/The Sims 4/Mods folder. Do not unzip it. When you enter the game, ensure that Scripting Mods are enabled in the Options menu. Scumbumbo and Deaderpool for help with writing the Python function. is there a way to tweek the mod so the ghosts that are no longer in the world can be deleted from the relationship panel? by the time m sims are elders everyone they know, with the exception of family, is dead. Is this compatible with Shimrod's Reduced Townie Generation? I don't want bunches of townies spawning but I don't want distantly-related Sims to get deleted either. Does it work with the new patch today Jan 13th 2015? Hi everyone. This mod is still working just fine with today's patch, as it didn't make any changes to the Story Progression files. @annachibi: Yes, Shimrod's mod will work with this mod. They both change different files. Bookmarking this one! Does it also work with the Fewer Elders mod? I'll also be interested to hear from players with farther-along games if it starts to affect lot loading time. But it would sure be nice to have it matter less that I didn't delete an Elder before she or he died a natural death and cluttered up my population count. Yes, it works just fine with Fewer Elders. I use both that and Reduced Townies myself. Hi! This mod sounds great. I'm just curious what it does differently than the no genealogocide mod? The no genealogocide mod prevents the game from running the "Genealogy Pruning" action, but leaves the "Max Population" action intact. This mod disables both. The no genealogocide mod also won't work properly if you have Outdoor Retreat installed as the December patch added some new story progression actions that weren't there when MIsterDinadan made his mod. This was exactly what I wanted to hear. Thanks a lot, Dark Gaia!